Newborns and infants are, probably, the most vulnerable in times of tragedy. in the Philippines does not sell pre-mix. may the spirit of bayanihan be with you. From drop off points, all donations will be sent to Philippine Red Cross. For transparency, please label your donations with your names. We are not out to make people's lives miserable by enforcing the ban on donations of powdered milk. We are focused on ensuring the safety of the babies who are most vulnerable in times of calamities. Let me reiterate the reasons why there should be no donations of powdered milk. Medical studies have linked formula donations to increased diarrhoea during crises, as was the case during Indonesia’s 2006 earthquake in Central Java. A 2012 UN Children’s Fund (UNICEF) study found one-week diarrhoea incidence among those who received milk substitutes after the earthquake was more than twice as high as those who did not (24.5 percent versus 11.5 percent); overall, the rate of diarrhoea among infants aged 12-23 months was five times higher than before the earthquake, which researchers linked to breast-milk substitute donations. “Uncontrolled distribution of infant formula exacerbates the risk of diarrhoea among infants and young children in emergencies,” concluded the study, a message aid agencies are still struggling to publicize. According to DOH Assistant Secretary Jean Paulyn Ubial, the lack of potable water and unsanitary condition at evacuation centers make it more dangerous for infants and babies to be fed with infant formula. However, despite that we still see calls for infant milk donations from media personalities, foundations and even medical schools! Special places such as mother and baby tents can be safe and secure places for feeding, rest, care and support for mothers and their children. These special places also help to prevent separation of mother and baby and provide peer support through a time of severe infants and mothers who are malnourished. 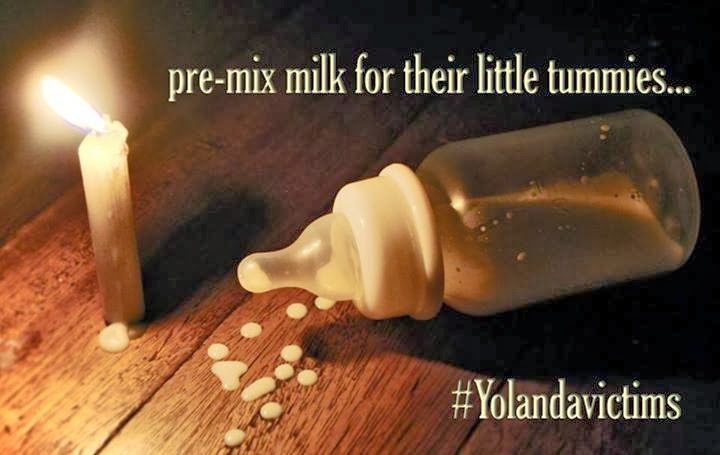 On ready to drink or pre-mixed formula, as shared by Dr. Anthony Calibo of the Department of Health, "[p]re-mix milk formula is not allowed to be donated as part of our Infant and Young Child Feeding Policy in normal circumstances and even in disasters and catastrophes." Instead, what the Department of Health really needs would be "[t]ents that will serve as makeshift areas for breastfeeding centers and relactation centers will be a great boost in the emergency response activities." Most people who call for milk powder donations simply do not know or understand why it is prohibited. So the next time you see such calls, perhaps you can post a link or share information about why milk donations can do more harm than good, despite the good intentions of the donors. During our collective past experiences (Ondoy, Sendong, Pablo) we found that the most important component is breastfeeding support to vulnerable mothers and babies. Even those who have already started to give formula can be supported back to breastfeeding. Breastfeeding protects the most vulnerable victims - the babies. So please know, when you donate your breastmilk, it goes to the general pool and you cannot earmark it specifically to a certain locality. IYCF coordinators need to assess the need and distribute the breastmilk accordingly so as to prevent the conversion of donated breastmilk into a substitute that will also affect the breastfeeding relationships of the mom-baby dyads in the calamity stricken areas.